With the technology getting mobile, we see a lot of companies focusing on them as they provide more utility to the user. Due to this shift in the technology sector, wearables have become the latest gadget for people. Wearable can be in the form of a smartwatch, an eyeglass or a fitness band which is used to track your physical activities or monitor health condition. Wearables are being used everywhere from fitness, retail, healthcare, banking and insurance, news to travel and manufacturing. Health and fitness is the most important sector for wearables, apart from other great features health and fitness was kept in the mind during the development. It is observed that wearable sport and fitness devices will alone reach around 80 million by late 2016 and the growth of this will be immense. With the introduction of wearables in the market, ear based wearables have been used less as compared to eye and wrist based ones. The long awaited Apple watch 2 and next generation android wear is expected to increase the usage significantly in health and fitness domain. Another emerging sector in the industry which is adopting the wearable technology at an unmatched rate. Wearables can impact on both retailers as well as on the consumer end. With it, the retailers can get an opportunity to make product easily accessible to consumers with likes of Wrist Gear or any other similar device. Wearables have opened gates for new opportunities such as location based sales promotions, in store operations and product placements for retailers. The wearables are already widespread in the Banking and Insurance sector. It is said that this sector has grown less as compared to other sectors due to strict regulations and inertia. The apps like Caixa Bank and Westpac have developed a smart watch application for stock markets. Wearables have addressed to the security and privacy concerns of the customers and have integrated new payment methods that can take banks to the next level. As per the Insurance journal, Insurance companies can take advantage from wearables from all aspects including marketing, product development, risk management and claims. These days people have started to explore places like never before. With a lot of opportunities for travel companies in the wearable domain, travel industry has been on the move as compared to other companies. Recently, Spring Airlines and Garmin D2 have designed wearables to improve the customer service and load flight plan information. The users do get intrigued towards the wearables and find them really interesting in the initial stage, thereafter, the level of enthusiasm drops. It is a challenge for the manufacturers to develop interesting and innovative wearables to keep the users engaged. If these things are kept in mind the the future of the wearables will be bright. 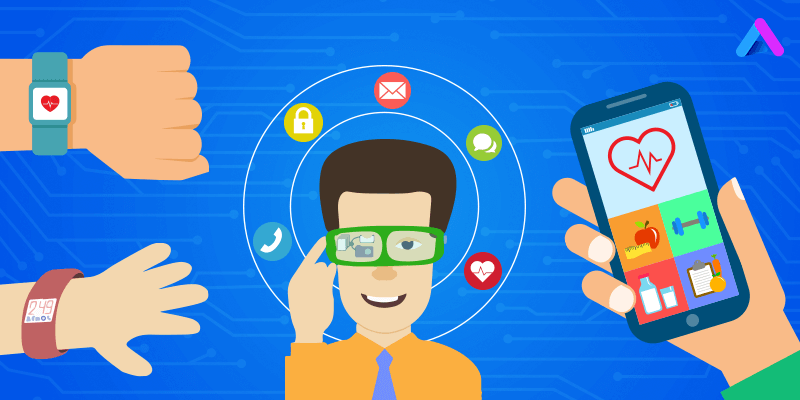 At AppInventiv, We develop customized and customer-centric applications that run flawlessly on wearable devices including smartwatches and glasses. Our developed wearable apps are helping enterprises and individuals in getting customized, business-aligned and user-centric solutions. Want to develop a wearable app? Why don’t you contact us?